Pairing innovative web training with quality parts, the ProForm Power 990 treadmill is a mid-range machine that’s been dropped squarely into the battle of the budget machines. If $1600 is too tough on your budget, then $900 for a treadmill with all sorts of console goodies and powered by a big 3.0 CHP motor should be the end of your search. The ProForm Power 990 treadmill comes with an LCD Grafixx™ display showing speed, time, distance, pulse, and calories burned. With the 16 pre-programmed workouts you get 4 Performance, 4 Distance, 4 Timed, and 4 Weight Loss, in addition to the iFit Live feature, a wireless internet connection that allows you to download programs from celebrity trainer Jillian Michaels, and run virtual trails all over the world. *Module and annual plan sold separately. Wireless network required. UPDATE: The Power 990 has been replaced by the Power 995i brand new model. 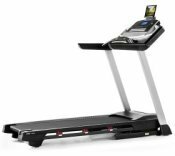 To find a comparable treadmill check out the new full lineup from ProForm to see which model appeals to you. This ProForm Power 990 treadmill comes with a 3.0 chp motor that has a self-cooling feature to improve its life and performance. This is an amazingly quiet motor that has more than enough power to pull the 20" x 55" tread belt plus a big user – up to 325 pounds. Since joint protection and comfort are prime reasons that people workout on treadmills, the deck on the Proform Power 990 features Adjustable Cushioning that allows the user to change the surface impact softer or harder. 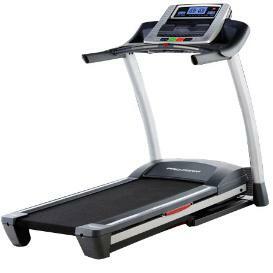 You’ll find very good marks in treadmill reviews on this model because of the better components and the advanced features such as iFit Live and the large motor. Just don’t pay full price for the Power 990. Proform’s three Power models for 2010 — the 690, 990 and 995 — are identical in the console styling and frame, but offers different size motors and they vary in the number of programs. Whichever one is the best buy depends on which one is on sale that week since they are generally marked down around 40% off the MSRP. The Power 990 has an MSRP of $1,599 but ProForm has put it on sale for as low as $899 – a steal! All ProForms come with Free Shipping, which saves you $125, but you can use the savings to purchase in-home assembly service for $150. We recommend you also buy an extended warranty of $90 for one year to improve on the 1-year parts/labor standard warranty. The Proform Power 990 treadmill is a Good Buy – when it goes on sale and you can save $700.